The Avatar Zao (Zao Gon Gen) seems to be recognized as one of the gods from the Shinto-Buddhist syncretism. However this has been the case for the Kawashimo from the early modern period. A more narrow opinion is that aside from the Forty-Two Bay wooden scriptures, this can’t be confirmed. However, Zao Gon Gen is enshrined within the Gakuen-ji Temple on a mountain ridge in Kawashimo. There’s also the possibility that this influence has in some way covered the actual Kawashimo shrine. The shrine listed in the Kawashimo area as ‘Ohomi-sha’ is referred to in the Engishiki as ‘Ohomi-jinja’. This is currently enshrined at the location Kawashimo Town 217 but there is also the shrine Tarumi Jinja nearby in Kawashimo Town, there are some who believe today that this could have been the main shrine back in ancient times. Whether the Zao Gon Gen is connected to Ohomi Shrine or Tarumi Shrine is definitely a matter for further thought. In modern times, there are documented references to ‘Oohime Daimyoujin’ or ‘Karasuhime Daimyoujin’. In fact, these are just alternate expressions for ‘Ohomi’. Attention is needed to the fact that in the ancient Izumo-district (of which Kawashimo was a part), there was a district official named ‘Taishin’. ‘Ohomi’ quite probably refers to the remaining clan name ‘Tai’. When worshipping at this shrine, it’s worth walking all around the main building. In the eaves of the roof there is a wooden pestle, thought to have been used in ritual ceremonies. It would be interested to find out if it played a part in new shrine dedication procedures. 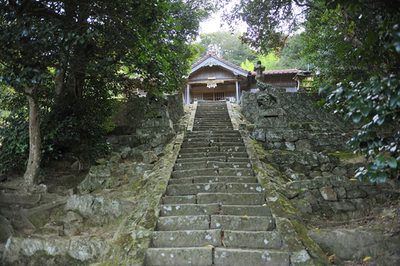 Geographically, this location now covers the area between Gakuen-ji Temple and the North part of Kunidomi in Izumo city. It was described in an extract from the Izumo-no-kuni-Fudoki as ‘the township of Uka made up of Kunidomi on the South East, Karakawa, Besshocho, Kawashita, Inomi etc on the West’. Mythologically, when Oonamuchi-no-mikoto proposed to Ayato-hime, she fled to Oku-Uka near the Fuse Mountains where there was a large hole in the mountainside. Flattened down grass nearby indicated she’d passed through that way. Sure that this was where she was hiding out, Oonamuchi asked the eminent kami Komori-Myojin to protect the area which lead to the naming of it as Fuse Valley. The significance of this hole has been speculated as the ‘Entrance to the Underworld ’or to the ‘Wild Boar Eye’ cave and even as a path to the Taisha (Great Shrine) itself. In addition to the aforementioned legend, there are some that say that Ayato-hime actually left home due to poor marital relations and was pursued by Oonamuchi with Komori-Myojin in tow. 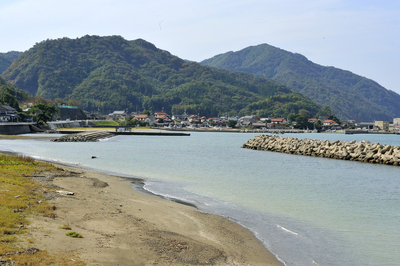 These days, looking along from Kawashimo harbor to the east side of Kitahama, twenty-six 90m wide wind turbines can be seen. Revisiting the area after a long absence offers surprising new scenery.